The temple of Ramses II at Abu Simbel. Abu Simbel was the site of two immense sandstone temples carved by order of Pharaoh Rameses II (c. 1304–1273 BC) out of the bank of the Nile near Aswan. The temples were dismantled and relocated in the near 1960s when the rising waters of the newly-constructed Aswan High Dam threatened their safety. 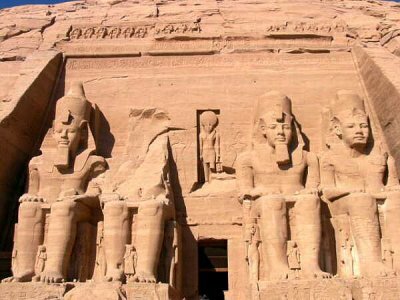 Abu Simbel is now a world heritage site. The twin temples at Abu Simbel stand as monuments to Rameses II himself and his queen Nefertari, to commemorate the alleged victory of Ramses at the Battle of Kadesh, and also to intimidate his Nubian neighbors. Four huge (20-meter/65-foot- high) statues of the pharaoh, in pairs, flank the entrance to the temple of Rameses. The head and torso of the statue to the left of the entrance fell during ancient times, probably due to an earthquake. This temple faces the east, and Re-Horakhty, one manifestation of the sun god, is shown inside the niche directly above the entrance. The alignment of the temple is such that twice a year the sun's rays penetrate into the innermost sanctuary to illuminate the seated statues of Ptah, Amun-Re, Rameses II, and Re-Horakhty.